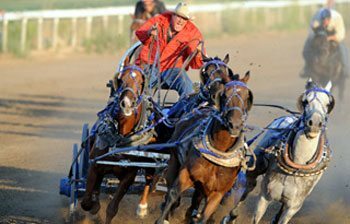 Three World Professional Chuckwagon Association drivers – Kirk Sutherland, Kelly Sutherland and Jason Glass will be joined by aggregate winner and former longtime WPCA driver Neal Walgenbach in Sunday’s final. It will be the 4th appearance in the final for Kirk Sutherland, the 5th for Jason Glass, the 19th appearance in the final for Kelly Sutherland, the 4th for Neal Walgenbach. Gary Gorst missed the final by 11 one-hundreds of a second. Day 9 also saw Kirk Sutherland, driving the Cam Clark Ford outfit, record the fast time of the night with a 1:14.68. Coming off barrel number 2 in semi-final heat number 8, Sutherland won top money by 65 one-hundreds of a second over Wayne Knight who placed 2nd for the night, followed by Kelly Sutherland, Jason Glass and Rick Fraser who filled out the top five for the night. The finals from the Calgary Stampede Rangeland Derby which will run at 8:00pm on Sunday, July 18.